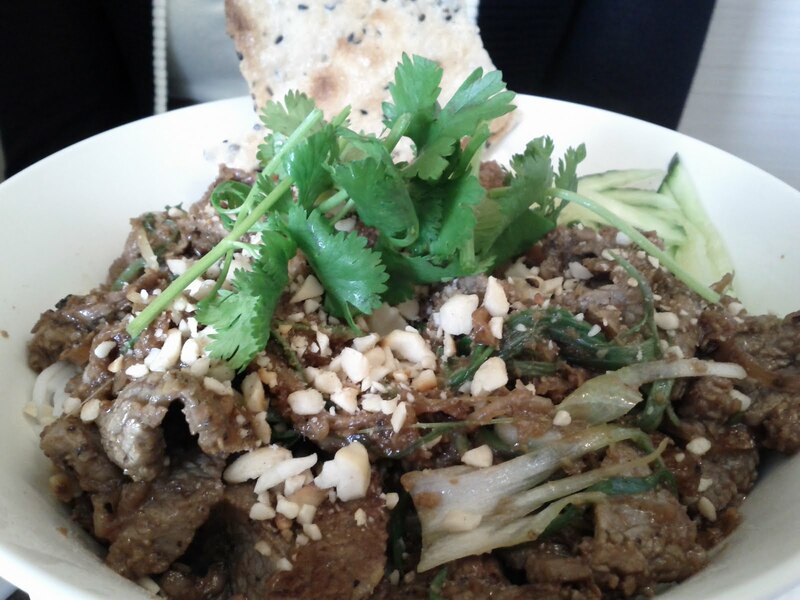 I have to seriously thank Jonathan Gold for reviewing Nha Trang last month. 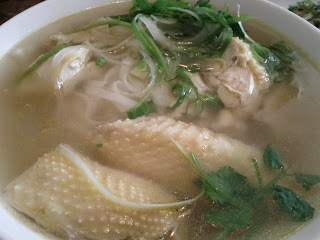 Having grown up in San Gabriel, I somehow never tasted the noodle soups of Central Vietnam until I ate at Ha VL in Portland last May. I immediately fell in love with the depth and varied flavors of the different rich soups, types of rice noodles and the thoughtfully prepared meat and seafood toppings. When I returned to LA, I was disappointed that the landscape was dotted with the standard Vietnamese Beef Pho and there was no place to feed my new addiction. 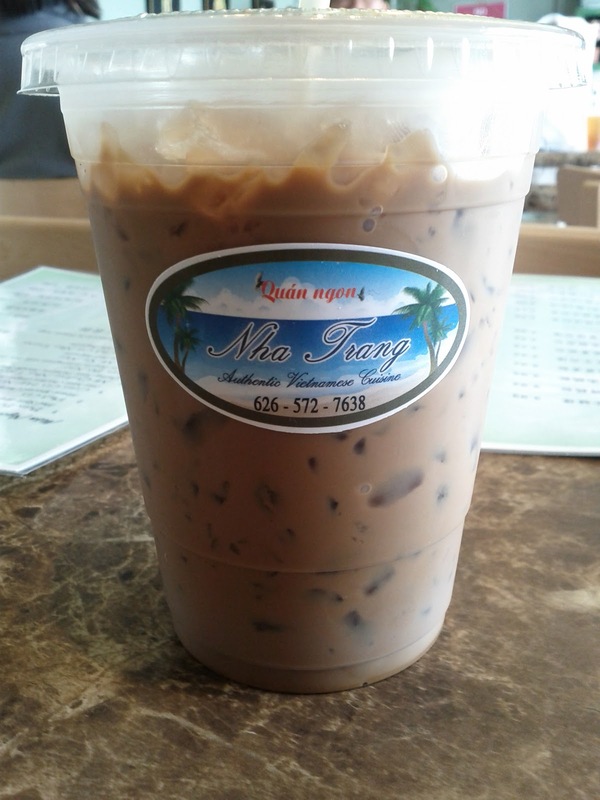 But at last, Nha Trang has arrived to save me! Nha Trang's noodle soups are made with fresh ingredients every day and the broth is cooked for hours with either chicken, seafood or beef and pork bones (no MSG!). They only make what they think they'll need for the day so if they run out of a particular soup you want then you're out of luck. There are only 8 items on the menu. 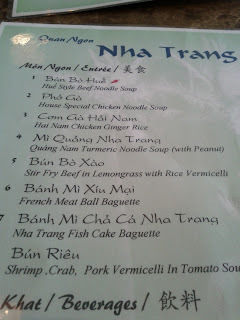 Six are noodle dishes and two are served with a baguette. Move aside Intelligentsia. I want my Iced Vietnamese Coffee. Slices of braised beef shank, a few cubes of pork blood pudding and a stewed pig knuckle sits atop of rice noodles in this rich beef broth. I've had Bun Bo Hue a couple of times in San Gabriel and Westminster in the past but they've always been disappointing. This one is gold. 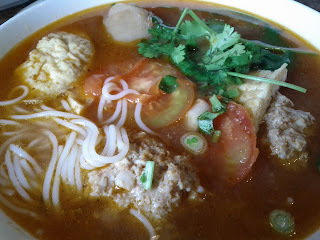 This tomato broth is amazing and the shrimp and crab meatballs adds a perfect seafood flavor to the noodles. This also comes with a few slices of pork, pork blood pudding and a pig knuckle. Nha Trang loves pork blood pudding and pig knuckle and so do I! Chicken noodle soup for the soul! I swear, this rich chicken soup will cure any cold. Buttery chicken essence oozes with every sip of the soup. The chicken is cooked daily with fresh chicken from the poultry shop and because it's fresh, it actually tastes like chicken, unlike the bland frankenchicken sold frozen at the regular supermarkets. 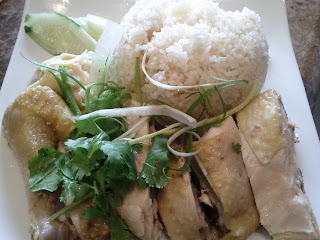 This is like Pho Ga because it uses the same chicken but it's served with rice that's been cooked in rich chicken broth. Since it's rice and easier to order as take-out, Nha Trang often sells out of the Pho Ga and Hainan Chicken early (by Noon-ish). I've seen people come pick up 4 or 5 orders at a time of the Hainam Chicken. 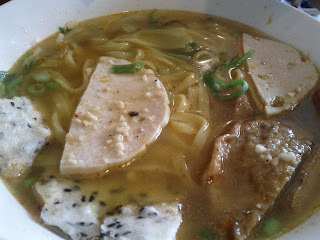 Of the 6 noodle dishes on the menu, this is the only one without soup. The rice vermicelli is topped with beef stir-fried with lemongrass. Tasty but I prefer soup. 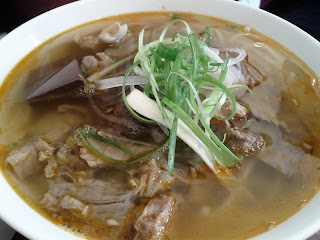 This would be good for those who can't bear the steam of a hot bowl of noodle soup in the Summer. This one is really special. It's the only item on the menu that's served with egg noodles and slices of fish cake. The seafood soup is boiled for hours with lots of shrimp and shrimp shells to achieve that deep sea flavor. Tumeric gives this soup a yellow glow and the ginger undertones of tumeric balances the fishiness to give you a perfect bowl from the sea. 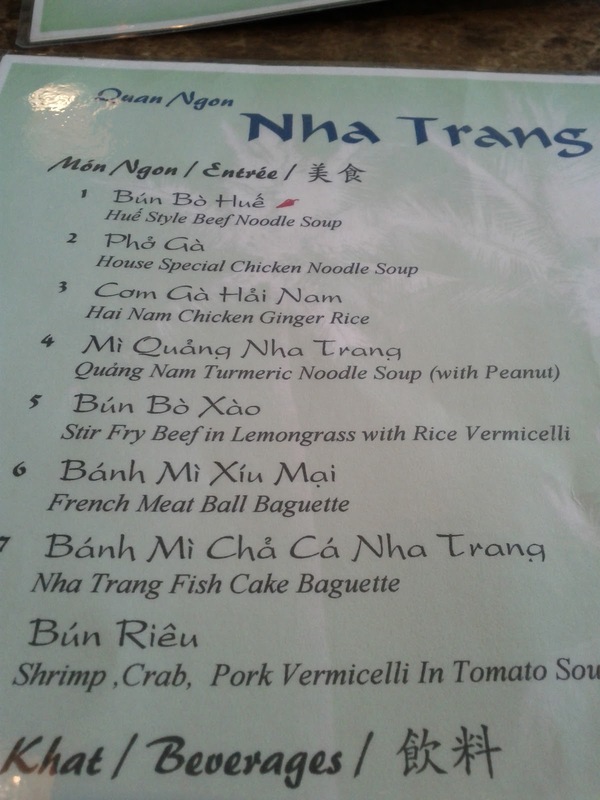 In the last month, I've been to Nha Trang multiple times and ate everything on the menu except the baguettes. The lady who runs the place is really nice and she recognizes me now and it's like going to a relative's house for lunch. I love all the noodle soups and it's almost painful to have to choose only one each time; they're each so different it's like they have their own personality. I would gladly exchange ten burger joints (Father's Office, Umami, The Counter and In-n-Outs combined) on the Westside for one Nha Trang to be within a 5-mile radius of Culver City. But alas, I can't so I'll have to continue to trek 25 minutes on the weekends and squeeze into one of Nha Trang's 16 seats to feed my addiction for delicious noodle soups. Tip: Happy Hour from 4:00pm to 5:00pm - Whatever noodle soups are left are only $4.95. *The shop is not visible from Valley Blvd. You have to enter the strip mall (Rich Plaza) it's in before you'll see it. Look out for two tall umbrellas in front of the shop.